In April, we made 6-inch paper-pieced Butterfly blocks. Susan made this one. In total, 29 quilters made 75 blocks which were won by Elizabeth and Deborah. Orange You Going To Try Paper Piecing in April? 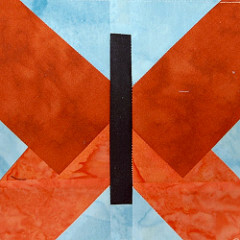 The Tag for ALL blog posts about this block is butterfly.